My friend went out to Santa Barbara a couple of weeks ago. For the life of me, I dunno how I've been there, and not come back with a magnet for myself. 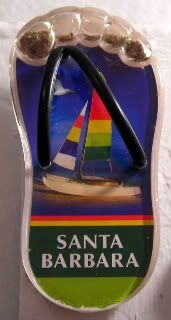 Of course, I have to admit, I don't think I've actually been to Santa Barbara proper...my guess is that seeing it from the PCH doesn't count. Hmmm. Next time. I'm picking this superduper cute (lookit the sand!) magnet for today, because with the late start to summer, it's only been in the last week or two that I've been seeing the flip-flops and the multicolored toenails on the subways and sidewalks. I do love that you can tell when summer's here...usually when it's a quiet day in the office, and all of a sudden you hear the soft flippity-flop of flip-flops shuffling by. Ah. Yeah, I didn't see an actual town, so I *really* must not have seen Real!SB. Heh.